In October, Hublot launched its pop-up store and Ferrari F1 Racing Simulator at The Dubai Mall. During the event, Rebecca Anne Proctor met with watch industry magnate Jean-Claude Biver to talk about his new role at LVMH and the essence of the Hublot brand. Jean-Claude Biver has seen it all in the watch industry. From his humble beginnings at Audemars Piguet, to his new position at the very top of the LVMH group, Biver has guided several brands towards prosperity, protecting them when needed. With a career that spans more than 40 years, the godfather of the watch industry now conducts his closest allies as the director of timepieces for Louis Vuitton Moët Hennessy. There he oversees Hublot, a brand that he bought, re-built, sold and also directed as the brand’s chief executive until early 2012, but also Zenith and TAG Heuer among others. He’s a maverick of sorts—a man who has taken risks to build concepts he believes in. Before making his mark on Hublot, Biver bought Blancpain, turned it into a haute horlogerie brand, and then sold it to the Swatch Group. He was subsequently offered Hublot just as he was on the verge of making a break from the watch industry. When he came on board in 2004, Hublot was a small watch brand in Spain selling around 9,000 watches for an average price of around $2,000 dollars. It is now one of the biggest labels in the industry and its revival is one of Biver’s most notable achievements. In his current role at LVMH, Biver is positioned, as he says, “like a conductor of an orchestra” coordinating the various watch brands he looks after with expert supervision, creative prowess and inspirational spirit. We met Biver in Dubai in the atrium of The Dubai Mall, during a special exhibition, “The Art of Fusion,” which showcased the different facets of his coined concept for Hublot. A first for Dubai and for Hublot, the exhibition also presented the launch of Hublot’s pop-up store and Ferrari F1 racing simulator also at The Dubai Mall. Such a pivotal show set the backdrop for a conversation with Biver in which he shared his views on the Middle Eastern market for luxury watches, his new role at LVMH, the Swiss watchmaking industry today and the essential character of the Hublot brand. You’ve recently been appointed president of LVMH’s watch division, and are now responsible for Zenith, Hublot, and Tag Heuer. What have you sought to develop within the company’s watch sector since your arrival? JCB: It seems like a big role, but it isn’t. We have three brands that are well-positioned in the market and that have their own DNA—there is no overlapping. We have three brands with good management and so my duty is to try to coordinate all of this. I am not the musician who is going to play music in each of the three brands. I want to conduct the musicians of the three brands. Maybe before I was a soloist playing a piano and now I am a conductor of an orchestra, we are still playing the same tunes. And many people of this orchestra have been with me for quite some time when I was a pianist. My perception is that nothing has changed though I travel a bit more now. While I came to Dubai for Hublot, this time I will also take the opportunity to look at the other brands we oversee – something that in the past I never did. So there’s a bit more work, more traveling, but all in all, I don’t see much difference. Also, these brands are not foreign to me. I have known each of them for quite some time. If you’ve been 40 years in the business, then you just know. It’s the same for Cartier and Chopard; I know these brands very well because I am in the industry. It would be different if I were coming from the perfume industry! You were offered the chance to revive the Hublot brand, and have turned it into a very successful one at that. What are the three elements that make Hublot unique within the watch industry? In your opinion, what drives customers to the brand? JCB: What sets Hublot apart from other brands is that it is a disruptive brand. In luxury, being disruptive is not so common because luxury tends and tries to connect to tradition and the past, and eventually even to repeat the past. Hublot is breaking these rules and saying, “We will not repeat, we will bring the tradition which we respect, understand and master, and we will connect this tradition to the future.” How? Like artists, if you look at a painting or a sculpture, never will you find an artist ready to repeat the Impressionists. Art is always going to the future. Art never comes back to the past and we are in the same position. I don’t want to compare us to painters and art history, but we come from the same idea that we are creating something always for tomorrow. If an artist from the past came back today and saw that all the art produced followed the same kind of art that he was creating long ago, he would wonder what had happened and why artists today hadn’t created works for the future-works that were different from those of the past. So Hublot is disruptive because it is a brand that connects the Swiss tradition to the future. When you connect tradition to the future, there are some changes. We call it the “art of fusion”; we are fusing two elements together—the past and the future, [which makes] a huge difference. This means that if we do a watch that is, for example, $1 million, there could be no gold, platinum and precious materials. In the past, gold was always linked to precious materials, as it gave a watch high value. Watches in the past used to be made in precious materials, and gold is heavy. Why do we want to make a heavy watch now? What for? We want a light watch, which is different from in the past! 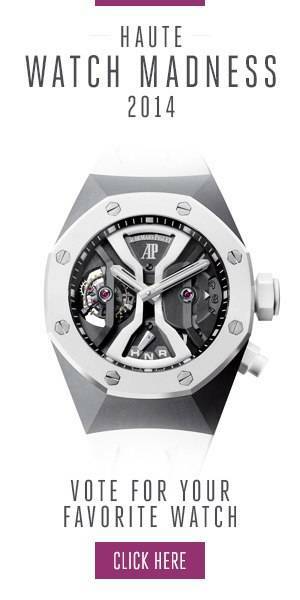 Hublot is a disruptive brand, which there are not many of; since most brands have a very traditional DNA, if they destroy that DNA, then they won’t exist. But Hublot is the contrary—it must be disruptive! Hublot has spent a lot of its marketing to align itself with some of the biggest sports brands (Ferrari, the World Cup and F1, to name a few). How do such campaigns directly impact the sales and growth of the brand? JCB: In reality, we follow our customer. Our customers have a certain lifestyle and most of them are connected to a certain sport—either a sport that they practice themselves or a sport that they watch. And we decided to follow our customers wherever they may go. If one goes to Costa Smeralda, then we must go there in the summer; if he goes skiing in Courchevel in the winter, then we must be there in winter; and if he goes to watch a football game, then we must be there. If he goes to Art Basel Miami Beach, then we must be there, too. If the customer finds us wherever he goes, then very quickly we belong to his lifestyle. He will see us wherever he goes. And this is why we are connected to sports. What, in your opinion, makes the Swiss industry so strong today? JCB: The Swiss watch industry is doing well because it is still very small. There are so many people who don’t even care to wear a watch. We are not like the phone industry, in which people in a thousand countries have four phones and suddenly cannot purchase a fifth. So we are still in an industry with a lot of wrists to conquer; the potential is huge. The Swiss watch industry slowed down a bit this year; however, it continues to be a record year. We still [brought in] 2.8 percent more [in sales] than we did last year, but there is a certain consolidation due to the uncertainty of the world. There was a crisis in the Middle East, in Syria and in Iraq, added to the uncertainties in Ukraine and Russia, and now to the democratic protests in Hong Kong—all of this makes people a bit weary, and when people are weary, they slow down their way of living. They spend less and travel less. So there is a certain consolidation, but on the longer term I see the market developing. So I am very confident in the future of the Swiss watch industry. The Swiss watch industry also has a great past. But then again, there can be no future without tradition. At the same time, there also can’t be a future without innovation. Sometimes people only understand innovation and not tradition. The trick is to understand both. According to you, what are the biggest trends in watchmaking today? JCB: I don’t see many new trends. People love colors and I see a lot of color now; people love lightweight watches and also watches with a strong personality and character. An understated watch is not what people like at the moment, but it will come back one day. So these for me are the trends: the materials, the colors and the weight. But the weight depends on the materials, as does the color. What we need to work on in the Swiss watchmaking industry is on using new materials in our watches.